Home Charts Ink Tables How much does your ink cost? How much does your ink cost? I decided to make my own ink price comparison chart because many others weren't very extensive. They were great for comparing the prices of a certain retailer's inks but didn't include rebottled or obscure inks like Architekt (De Atramentis rebottled) or Louis Vuitton. The inks are ranked from highest to lowest according to the cents per mL price. Most of the prices are from Goulet Pens with some notable exceptions. Waterman, Parker, and Pelikan Edelstein inks are sold by Goulet, but I chose to use different prices for them because Goulet was either overcharging or selling at one of the best prices which you won't find at many other places. For Sailor Bung Box, I used the prices from Bung Box's Amazon page but excluded the $22 shipping. If you notice an ink I don't have listed here, please contact me, and I'll update the list. *This price does not include the $22 shipping. ** Lexington Gray is also sold at this price. *Prices were originally $8.95, $12.95, and $26.95 respectively. 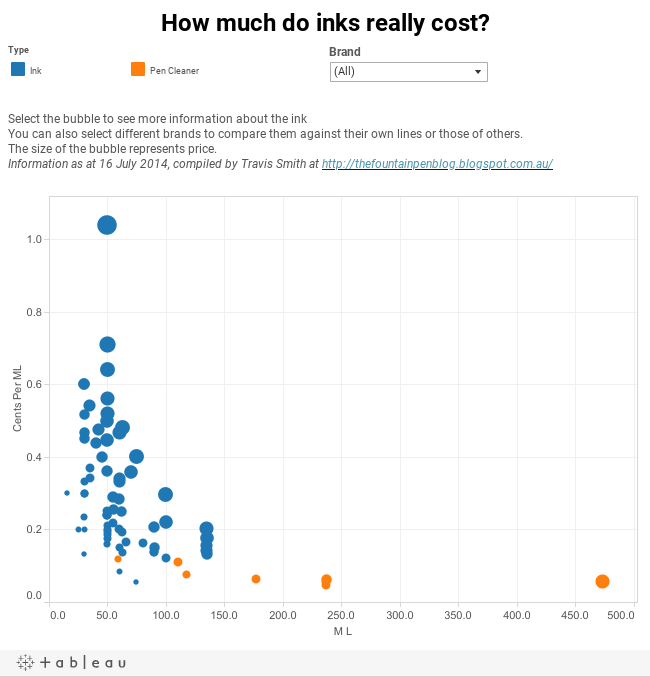 This chart, created by a reader Neil, is excellent for visualizing how expensive certain inks are compared to others. As an example, the vast price difference between Louis Vuitton and Chesterfield inks becomes much clearer with this chart than with the table. Thanks, Neil! Visit his Google+ page to see some wonderful Copperplate calligraphy. Several of the results surprised me. First, it's not always cheaper to buy in bulk. As an example, Baystate Blue is almost 2 cents per ml more expensive in the 4.5oz bottle than in the 3oz bottle. Another great example is J.B.'s Perfect Pen Flush from Fahrney's Pens- the 8oz bottle is cheaper per ml than the 4 oz as you would expect, but the 16 oz is more expensive per ml. For the Noodler's ink, the price difference could easily be attributed to the bottle's eyedropper; whereas, the J.B.'s Pen Flush is more expensive, but the bottle offers no special features like the Noodler's eyedropper. Another surprising discovery was how much more expensive or cheaper rebottled inks were compared to the originals. Some of the worst markups included Fahrney's Ever Write (rebottled Private Reserve) and the old formulation of Graf von Faber Castell ink (rebottled Pelikan 4001). There were also some fantastic deals, mainly Chesterfield 100ml and the less impressive Architekt line. Chesterfield Archival Vault in the 100ml size (rebottled Diamine Registrar's Blue-Black) may be the best value of any rebottled ink at less than half the price per ml of the original. Something else to note is that many inks with low per bottle costs often have high per ml costs. Kaweco, Delta, Pelikan Highlighter, Visconti, Aurora, Montblanc LE, and the Noodler's 1oz inks are all in the top 20 in the cents per ml category but less than $20 per bottle. When you think an ink is a great deal, check the cents per ml price to be sure you actually are. I hope this will prove to be useful to you while shopping for your next ink! Where are you getting pricing on JB's pen flush? Jim Baer himself doesn't even sell it for that, Retail is $7, 11, and $20 for the three sizes. The pricing is from Fahrney's Pens. Thanks for telling me that, and I will update the chart with those prices as soon as I return home.